In case you haven't heard, North Dakota's economy is on a tear. 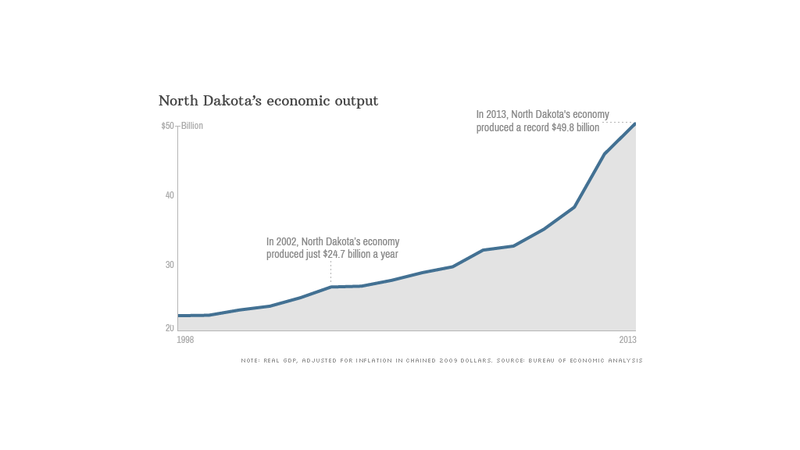 Fueled by a massive oil boom, the state's economic output has more than doubled in just 11 years, according to Bureau of Economic Analysis data on state gross domestic products (GDP) released Wednesday. In 2013, North Dakota's economy produced a record $49.8 billion -- up from a mere $24.7 billion in 2002. That's adjusted for inflation. While that's still small compared to most states, North Dakota is quickly climbing in the ranks. Back in 2002, the state had the country's second smallest economy -- only Vermont had smaller economic output. As of last year, North Dakota had surpassed Wyoming, Montana, and South Dakota to become the fifth smallest state economy. Even though the state economy is still modest, the output per person is high. North Dakota has the second highest level of GDP per capita, generating about $69,000 in economic activity per resident. Only Alaska ranks higher. The driving force behind this surge in economic output: Oil, oil and more oil. In recent years new technology has made it possible for drillers to reach pockets of oil that had previously been inaccessible -- spurring a full-fledged oil boom in the northwest corner of the state. This year, daily oil production topped 900,000 barrels -- nine times the mere 100,000 barrels per day in 1998. And North Dakota now ranks as the second largest oil-producing state in the nation, according to the U.S. Energy Information Administration. Along with oil, North Dakota has been pumping out thousands of jobs. Between 1998 and 2013, the state added 132,000 jobs -- a 41% increase. More than half of those were added within the past three years. And that growth isn't showing any signs of stopping. A new recruiting campaign launched in May by the North Dakota Economic Development Foundation and oil giant Hess (HES) aims to fill the more than 20,000 jobs that they say are currently available. Big oil isn't the only one seeking workers, every industry in the state is hiring. Restaurants, retailers, bars and gas stations are all desperately seeking workers -- and are willing to pay top dollar. But the picture isn't all rosy. Thanks to the influx of people, populations in some cities have quadrupled and a severe housing shortage has emerged. Rent for whatever housing is available is among the most expensive in the country. As a result, many workers are pulling in fat paychecks but are technically homeless -- living in cars, RVs, tents or even on the streets. In its latest homeless estimates, the Department of Housing and Urban Development found that North Dakota saw the biggest surge in homelessness of any state. The problem has become so severe that the local Salvation Army has even bought people tickets back to where they came from when they arrive in the state with nowhere to live. CNNMoney's Annalyn Kurtz contributed data analysis to this report.